I’m really not sure what happened here, but the Limited Foil Edition of the first issue of Elven is something that exists. Foil on the cover of that book, however, is not something that exists. It’s almost the exact same cover as the regular edition, with some slight color tweaks. This is the regular edition … quite easy to find. After the first round of Ultra 5000 incentive books (there were separate print runs of 5,000 books for each of the early Ultraverse launch titles … I’ll write more on these soon), there were a few different “limited editions” for books such as Foxfire 1, Ultraforce 2, Lord Pumpkin 4, and Elven 1. But they didn’t have the enhanced silver foil covers that the Ultra 5000 books had. The Elven Limited Foil Edition stubbornly stuck to this trend. 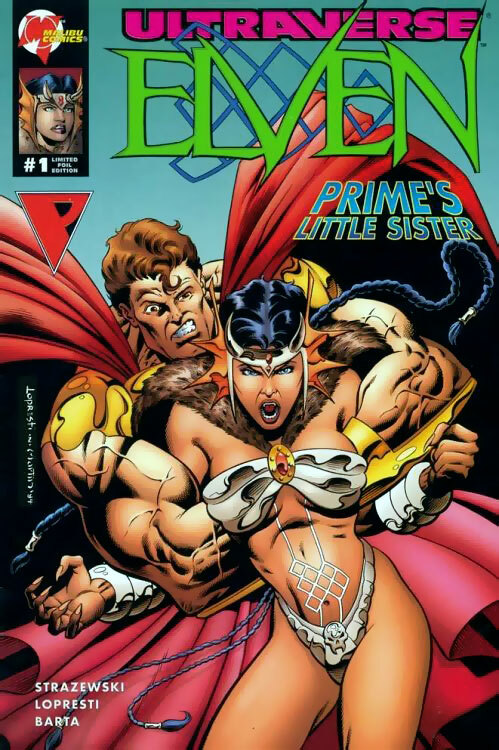 Anyway, the lack of foil is about the only thing that sticks out about this cover except for Prime grabbing Elven’s arms and pinning them behind her back. Nothing helps calm down an angry person quite like that. 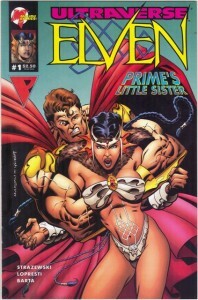 Elven ran for four issues (plus a “zero” issue) and it’s pretty easy to snag the whole lot for a few dollars off eBay. The trick to finding the “foil” edition is to look for a green title (the regular No. 1 issue has a yellow title). It shouldn’t set you back more than a buck or two. This is one of the easier limited-edition Ultraverse books, simply because most people don’t even know it is there.